NMAH | Artificial Anatomy | History | What is Papier-Mache? 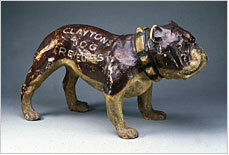 Advertisement for Clayton�s Dog Remedies, about 1890 13" H x 12" W x 28" D 34.3 H x 31.7 W x 71.D cm. Clayton�s Dog Remedies was among many veterinary patent medicines. Papier-mâché literally means chewed paper, and it historically has involved various complicated techniques and materials. Paper in pulp, strips, or sheet form was held together with binders such as hide glue or natural resins. Fillers were added to the paper and glue mix to give a smoother surface or add strength. Papier-mâché is lightweight, hard, and strong, and some types could be worked like wood. Pieces were finished using lacquer, inlay, paint, or varnish. The earliest known examples of papier-mâché are pot lids and helmets from China's Han Dynasty (B.C. 202-220 A.D.) and a falcon's coffin from Persia. 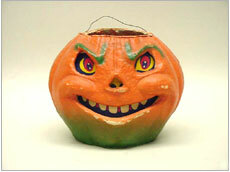 Both purely decorative items such as carnival masks and Halloween decorations and functional objects such as tables, chairs, trays, and eyeglass cases were produced. Advertisement for Scott�s Emulsion (cod liver oil), about 1890 4' 8" H x 29" W x 25" D 1.42 H x 73.7 W x 63.5 D cm. Scott�s Cod Liver Oil was first introduced in 1876. 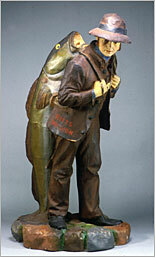 The figure of a man carrying a fish over his shoulder became their trademark in 1886.